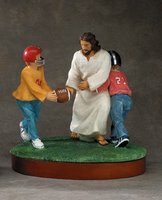 On the 3rd day of Christmas you could show who is your "true love" by buying a sports Jesus statuette for $19.95. 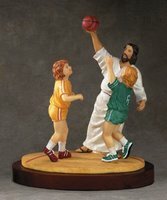 Both the basketball and soccer ones have Jesus keeping the ball away from the kids ("suffer the little children?"). 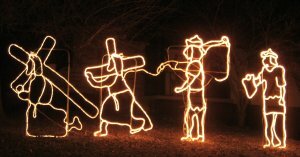 The football one has a kid trying to tackle Jesus (that's going to cause some trouble on Judgment Day!). Only the baseball one actually has Jesus teaching instead of competing against the kids (but even then I wouldn't buy it!). hey caught your comments over on cheatseekingmissles. couldn't agree more. i was debating the admin over at blogs for God about the same issue but couldn't get him/her to address the real issue that the church needs to look out for the poor and a just government. by the way, love the title and description of your blog. that is the new prophetic call... to get christians to shut up. Oh for Pete's sake Fletch - we're talking 'Jesus Junk' here on this blog. At least with regards to this post. Let's not drag our debate on the merits of bureaucratic induced welfare across three different places just because we don't see eye-to-eye. That said, you'll have to excuse me as I'm piling up a whole lotta Christ crud for a Friday fun post tomorrow.